Even though it was an early morning and we all had a great time spent at the Zabbix Conference Hollywood Award ceremony in the previous evening, everyone was ready to listen and learn. Morning of the second day began with two tracks of Zabbix Workshops, teaching participants how to build an HA cluster for Zabbix server, preprocess Zabbix items, secure your data flow with encryption and pro-actively resolve the problems with remote commands. After which we got back to the speeches! Gareth spoke about Concierge Paradigm and Autopilot pattern. His talk was about how orchestration in Docker can be simplified by running Zabbix agent as a co-process that can do an auto-registration for you or scale up/scale down. There were some practical examples of what they do for enterprise level containers in clouds or on premises. We encourage you to check his presentation in more detail, plus enjoy a good English humor, fused throughout his slides. Ilya speaks how Badoo, one of the largest dating online services, uses Zabbix to monitor their environment in DCs around the world and how they taught their developers to send metrics to Zabbix for their own benefit without getting into much detail how Zabbix actually works. In order to create fast and flexible monitoring for critical components, Badoo came up with an idea of involving developers into that process. In his slides, you’ll see how they’ve come a long road from Low Level Discovery to SuperDiscovery. Want to know how Zabbix Support Team deals with tickets 24/7? 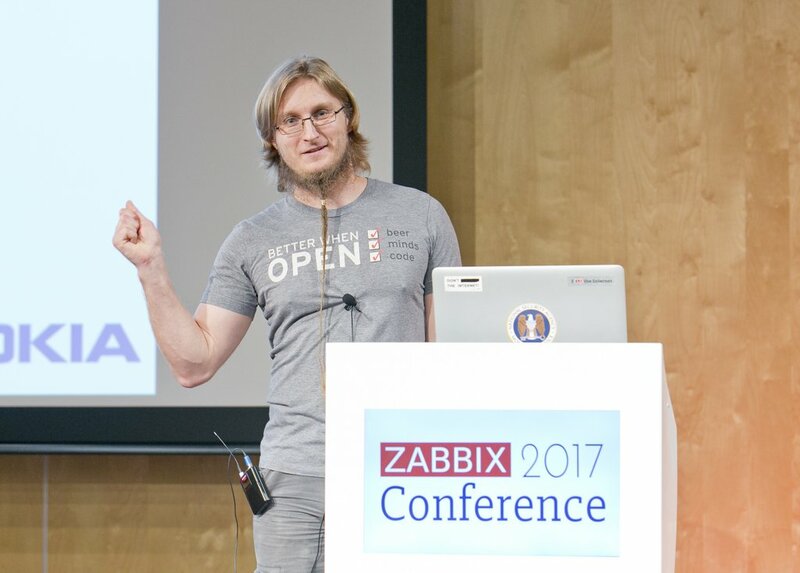 Zabbix Certified Trainer and Support Engineer, Oleg Ivanivskyi, will tell our story in detail! 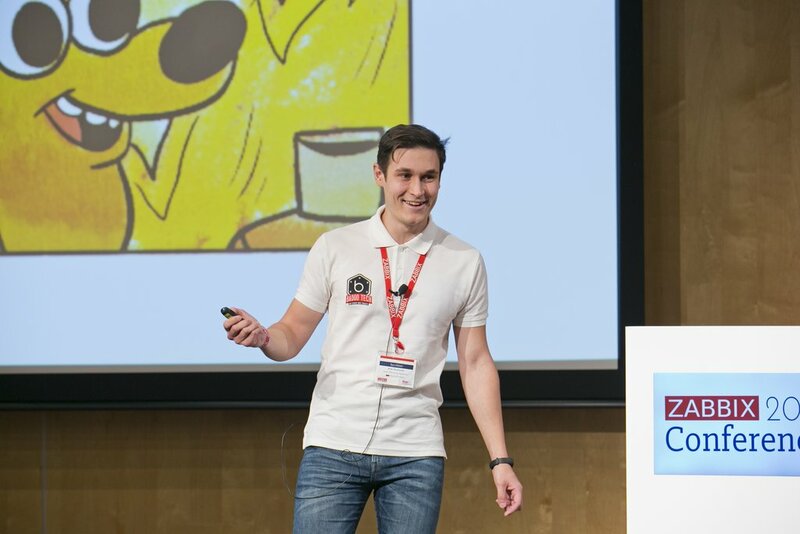 Oleg reveals challenges Zabbix Support Team faces and gives pointers on how to avoid common problems, what tools to use to debug and how to report problems so they can be solved super fast. What type of chat do you use? Ever heard of ChatOps? 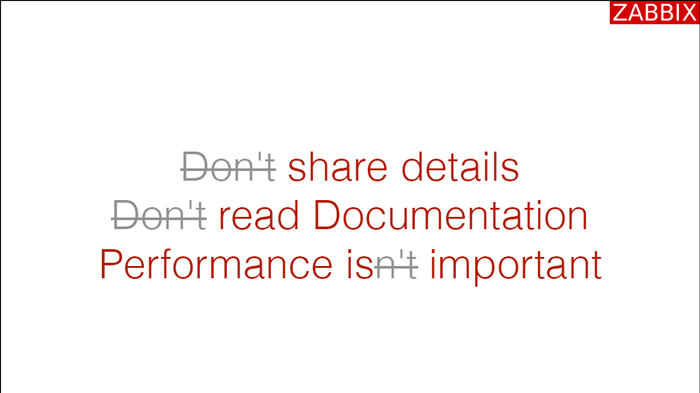 Well, you will find out about it in the Miroslav’s presentation. Even if you do not know this term, you soon might be using it daily. Zabbix Chat bot called ludolph is helping Miroslav’s team on their day-to-day operations and it communicates with Zabbix using only API. One of the most active Zabbix community members, Rihards aka “richlv”, explains why and when to upgrade to newer versions of Zabbix and how to do that properly resulting in a better sleep for the support team. Rihards uses an example at a division of Nokia, where Zabbix is a great helper keeping their infrastructure healthy. His talk goes through the process of upgrading a quite complicated Zabbix environment, as well as various approaches to monitoring that they found especially useful. 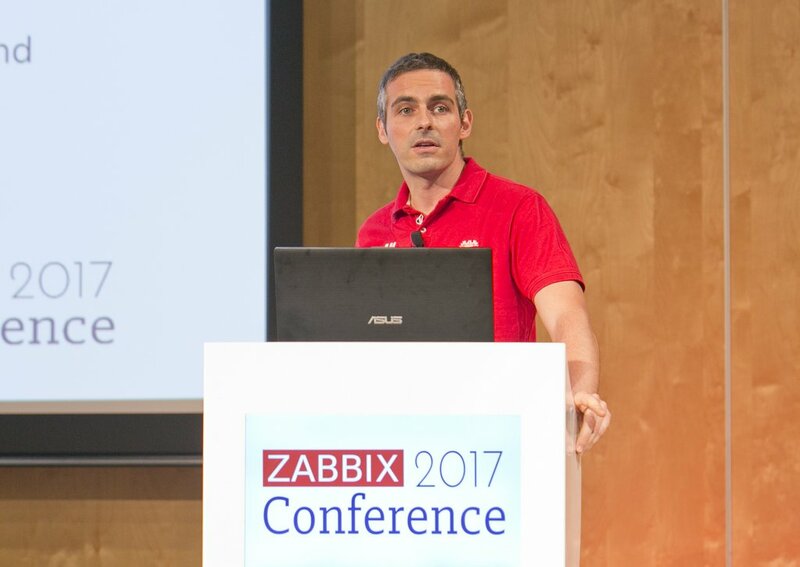 A story by Xavier Schneider, who talks about how Zabbix is used at Natixis, one of the biggest French corporate and investment banks, with more than 20000 hosts, 2 000 000 metrics and 1200+ users. 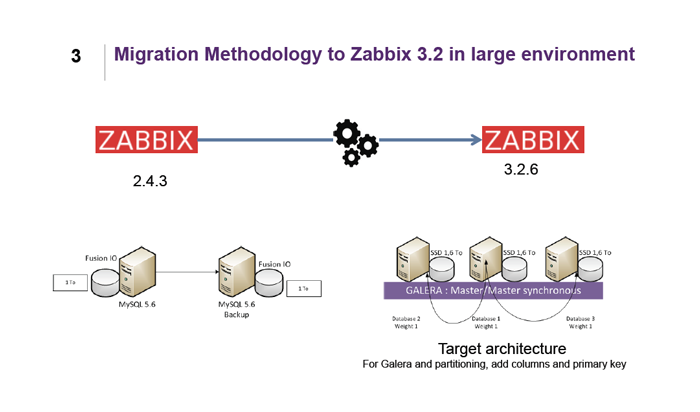 How the migration to Zabbix 3.2 was done and where Galera Cluster fits in in order to provide performance and high availability. Oh, and some nice Grafana dashboards are included as well! Everything you ever needed to know about monitoring infrastructure in a large banking environment! Zabbix is all about monitoring, but when it comes to incident management, integration with Service Desks such as ServiceNow is very beneficial. 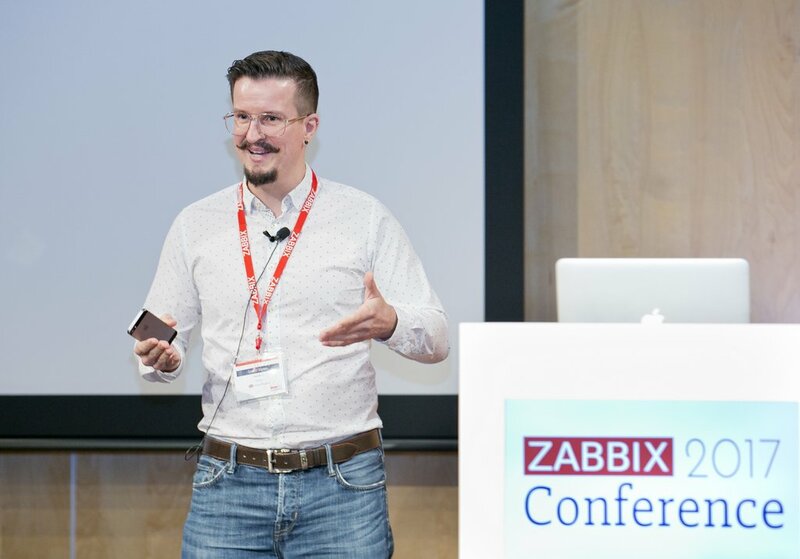 TV2 Denmark experts, Morten Moesgaard and Michael Toft Andersen, explained how to build a proper integration using Zabbix notification scripts, so Zabbix can monitor and detect problems. And then create incidents in ServiceNow, where they can be handled with a help of powerful features like playbooks full of problem knowledge. IoT and Smart cities are the trends that getting more and more attention these days, and Zabbix as universal monitoring platform can be used to monitor and collect data in IoT, as explained by Fabrizio. Sensors and hardware used in IoT don’t normally support SNMP, so other protocols like Modbus should be employed. 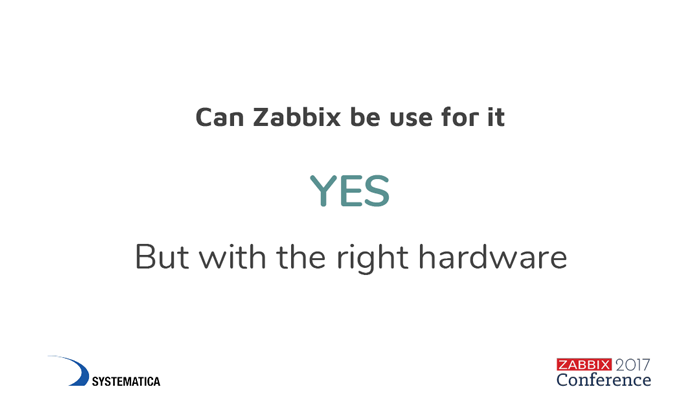 Thanks to Zabbix loadable modules, Modbus is already supported, out-of-the-box. So the only requirement left is a proper hardware that can be used in non-conditioned and dusty environments. James Green talks about the road and reasons bringing Open Source software to a large enterprise and what are the advantages and reasons of NHK International behind choosing specifically Zabbix, as opposed to other Open Source tools. Serg Mescheryakov, a fan of prediction monitoring, together with Kristina Kucherova, first female technical speaker at ZabConf, shared three different case studies in great detail exploring the usage of trend prediction monitoring with Zabbix, what are the cons and the pros and what can be improved in the future Zabbix releases. After a series of long speeches, we gave a road to our Lightning Talks, which are short, entertaining and quick-witted speeches, having become an integral part of the agenda of Day 2. Zabbix Marketing Specialist, Katerina Jastrebova, paid tribute to Zabbix community. How to meet and maintain connection with Zabbix users and customers in different parts of the world? With Zabbix Meetups! And Zabbix fans and partners play a vital role here, helping Zabbix organize meetups all around the globe. 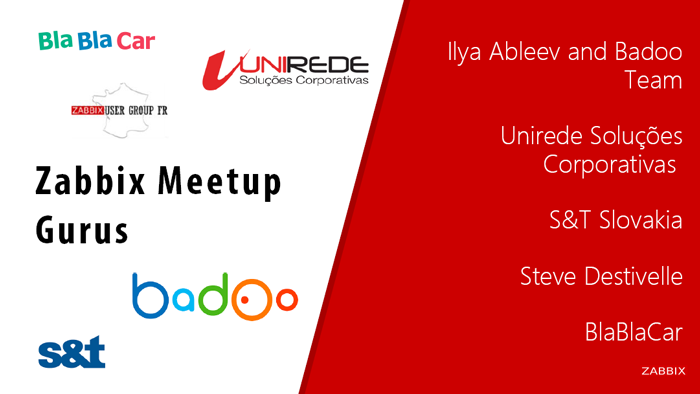 Zabbix Evangelist, Steve Destivelle, together with Ilya Ableev and Zabbix Premium Partner, Luciano Alves from Unirede, share their experience of organizing and hosting regular Zabbix meetups in their countries. Everyone can organize an official Zabbix meetup! How? Find answers in the slides! In his already third speech, Ilya gives a perfect example of community-driven top quality product – an integration he developed to send notifications from Zabbix directly into Telegram (with graphs!). Zabbix Evangelist Vladimir just can’t stop, he has so many projects! Now introducing his Zabbix Query Language based on LISP to easily automate things in Zabbix. Try it out and help Vladimir polish it. Wolfgang Alper and Zabbix in Munich subway: I guess I just adore trams! 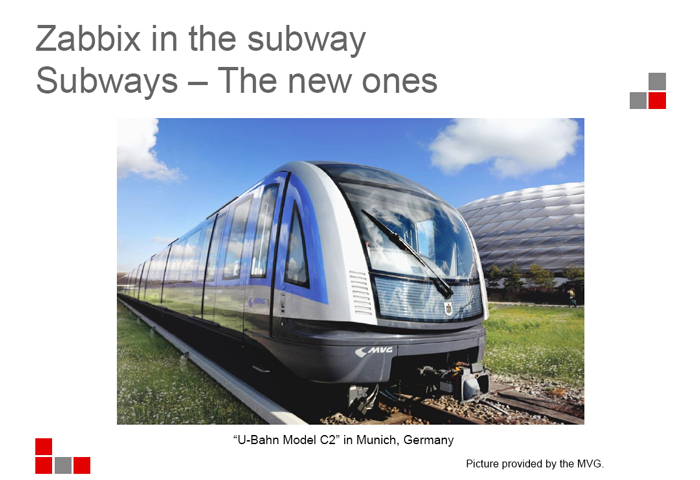 In Munich, all trams and subway trains’ equipment are monitored by Zabbix, once more proving that there are no limitation on what is possible with Zabbix! A very entertaining and light talk, where technical details were mixed with lighthearted jokes and passion for Zabbix. In Wolfgang’s presentation, you will discover very attractive visualizations created for this project in Zabbix, so that non-IT people would easily grasp what’s going on. There’s no such thing as “too much tweeting”! While our conference if filled with new ideas that need a lot of attention to learn, there shouldn’t be all hard work without some distraction! 🙂 During these 2 productive days, we offered everyone at Zabbix Conference to take part in special Zabbix Challenges. You tweeted pictures and typed questions, scoring points, and we counted your hashtags determining the most socially active participant! The prize for “Most Passionate Twitter Feed” went to Steve Destivelle from France. And Dmitry Tigrov outran everyone in the amount of sent-in questions and completed challenges. Thank you all for your involvement! Alexei gave a warm speech, saying how he enjoyed the conference, thanking everyone for coming and praising Zabbix Team for the hard work. Inspired by this year’s conference, we already have some ideas for the next one! Surprises are guaranteed! 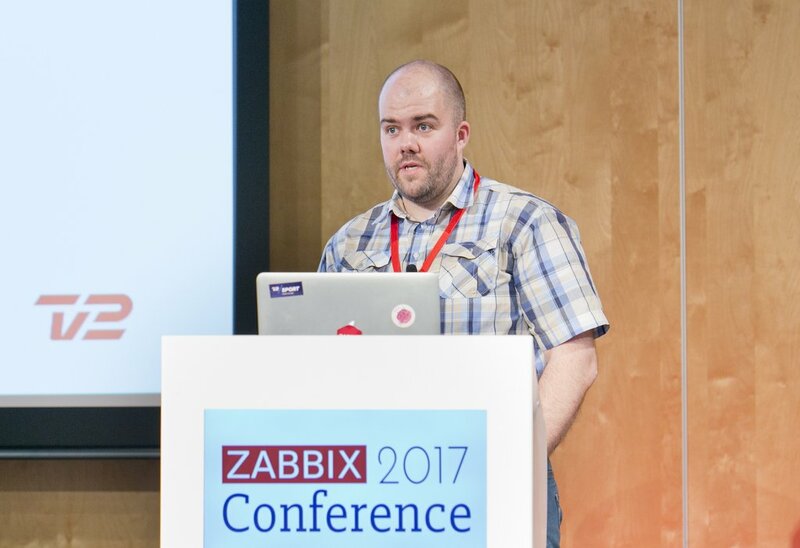 You can find all of the presentations mentioned in this post on the Zabbix Conference 2017 agenda page. Enjoy the moments in our Photo Gallery!